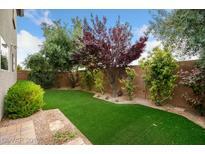 Below you can view all the homes for sale in the Huntington Village subdivision located in Las Vegas Nevada. Listings in Huntington Village are updated daily from data we receive from the Las Vegas multiple listing service. To learn more about any of these homes or to receive custom notifications when a new property is listed for sale in Huntington Village, give us a call at 702-323-5933. Step outside to a serene backyard perfect for a family BBQ. MLS#2089183. Urban Nest Realty. You will fall in love with this one! MLS#2088687. Redfin. Back Yard Boasts A Pergola Covered Patio And Gorgeous Landscaping. MLS#2088185. Signature Real Estate Group. Ideal Southwest Location*Directly West of Rhodes Ranch*Lovely Starter home complete with all Appliances*Soft-Water Conditioning System*Clean* Elevated Lot w/Mountain Views*Full Mature Landscaping & Just enough Grass to keep cool in Summer*Tile in Kitchen*Woodlike flooring downstairs and hallways in all traffic areas*Must see to appreciate* MLS#2088399. BHHS Nevada Properties. Close to Shopping, Dinning, Entertainment And Accessible to The 215 Freeway. Don't miss this beauty! MLS#2087852. Signature Real Estate Group. Newer Wood Laminate Flooring in Spacious Living Room*Kitchen With Breakfast Bar & Pantry*Convenient Upstairs Laundry Room* HUGE Loft*Over-Sized Master Bedroom With Walk-In Closet*Neutral Colors Throughout*Large 2 Car Garage*Low Maintenance Desert Landscaping In Front Yard*Blank Canvas In Cozy Backyard*Located Near Wet & Wild! MLS#2087821. Urban Nest Realty. All appliances included, pre-wired surround-sound, tank-less water heater! MLS#2087274. eXp Realty. Spacious loft and roomy backyard! **MUST SEE** MLS#2086423. Simply Vegas. Seperate Formal Living Room & Dining Rooms.Huge Loft/Playroom Upstairs 2nd family Room MLS#2085605. LIFE Realty. "PRICE REDUCTION FOR QUICK SALE" Don't miss this great opportunity... MLS#2084026. Realty 360. Tenant will be given 30 day notice upon accepted offer or willing to stay MLS#2083529. McDougall Real Estate Group. Lots of great places to entertain. Low HOA. DON'T MISS! MLS#2082841. Offerpad. All Appliances Are Included. Move In Ready. MLS#2081408. NewMarket Realty Group LLC. Swing by and see it TODAY! MLS#2081077. Platinum R.E. Professionals. Upgrades include stone pattern tile, contemporary paint, black granite, and Victorian Desert cabinetry. MLS#2078777. BHHS Nevada Properties. Fully paved patio backyard. Brand new water heater. MLS#2078306. BHHS Nevada Properties. Quiet Neighborhood With Great Mountain Views. MLS#2076657. Keller Williams Realty SW. Very clean, great condition and ready for your buyer! MLS#2074664. Avenues Realty America. Ceiling fans & solar screens throughout, security doors on front door/back slider. MLS#2072953. Urban Nest Realty. Lower Level features 3 Bedrooms and a Family Area with access to the Backyard. MLS#2068671. Realty ONE Group, Inc.
Off the upstairs bonus room there's a great balcony to enjoy the Mountain Views! Come see it today! MLS#2063794. Maxim Properties. 2 bedroom with a loft! Downstairs open floor plan! MLS#2055687. Urban Nest Realty. Upgraded features include fresh interior paint and new carpet. MLS#2048350. OD Nevada Brokerage, LLC. Put This One On Your List To See! MLS#2044693. Addicted Realty LLC.